Asteroids are diverse and numerous solar system objects, from the large number of objects in the main asteroid belt to the relatively small near-Earth population. Understanding their physical properties is essential to understanding the evolution of the solar system, and asteroid morphology is a complex field in its own right. 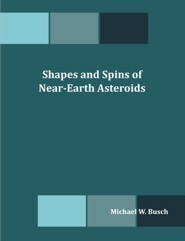 The histories of individual asteroids, and particularly near-Earth objects, reflect continuous interaction among their shapes, rotation states, and orbits due to the effects of radiation pressure. Radar astronomy has provided detailed information on the orbits, sizes, shapes, rotation states, and composition of many asteroids. To improve the capabilities of asteroid radar observations, I have developed the technique of radar speckle tracking. The echoes from different points on the surface of a radar target interfere with each other, producing a pattern of bright and dark speckles across the surface of the Earth. Using radio astronomy techniques, I track the motion of speckles between several ground stations during a radar experiment to accurately determine the rotation state of the target. Speckle tracking is a powerful tool both to determine the orbital evolution of near-Earth asteroids, particularly potential Earth impactors, and to survey the overall physical properties of the asteroid population. In addition, I have studied applying the techniques of adaptive optics and radio interferometry to asteroid science. These will become more useful with the next generation of asteroid-detecting surveys and the construction of large sub-millimeter interferometers. Interferometry in particular will soon be able to survey the entire asteroid belt.